Not really red as you can see, but still Royal! As this Monarch butterfly will attest to. A touch of red does appear in the base of the flower tubes, but the lobes are pink with a touch of orange in the middle. Royal Red Butterfly Bush has a relaxed habit which keeps it from getting quite as tall as some of the other butterfly bushes. The flowers start opening from the bottom of the panicle and gracefully continue up along the stem. Flower stems are often in threes, with the larger flower in the middle. This plant is sometimes available in plug trays. These trays hold 128 of all the same plant. They are a great low cost way to fill a lot of space. Each cell is 3/4 of inch by an inch. 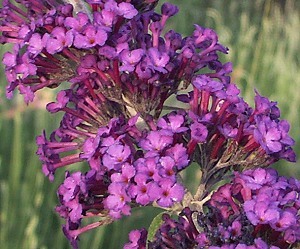 Check here to see if Royal Red Butterfly Bush Plug Trays are available. Royal Red Butterfly Bush makes a great addition to our Wildlife Herb Garden Six Pack and to our Zone 5-11 or Zone 8-11 Fragrant Herb Garden Six Packs.